The Constitutional Court has been out of action for almost two weeks, as its nine-member bench remains unfilled amid continuing partisan deadlock over the confirmation of a progressive justice nominee. The situation reveals the growing unease among conservative lawmakers with the progressive shift in the judiciary under liberal President Moon Jae-in. The National Assembly was supposed to confirm the appointment of justices Kim Ki-young, Lee Jong-seok and Lee Young-jin, recommended by the ruling Democratic Party of Korea (DPK), the main opposition Liberty Korea Party (LKP) and the minor opposition Bareunmirae Party (BMP), respectively, Sept. 20. But the opposition parties boycotted the confirmation vote, saying they could not accept the ruling party's appointee. The political deadlock has left the court paralyzed as it cannot open hearings with only six justices. "Without a full bench, or at least seven justices, the Constitutional Court cannot hold hearings. It can only sort out which cases to take up," Park Jun-hee, a press officer at the court, told The Korea Times, Monday. "If the confirmation vote is not passed within this week, this situation could continue for a month as the National Assembly will halt legislative sessions next week for the annual government operations audit." On Sept. 19, five justices — including former court President Lee Jin-sung — stepped down as their six-year terms finished. Two days later, two of the vacant positions were filled with Supreme Court Chief Justice Kim Myeong-su's nominees, Lee Suk-tae and Lee Eun-ae, both with a more progressive streak than their predecessors. On the same day, President Moon appointed Yoo Nam-seok, who had remained on the bench and is also known for his progressive leanings, as the new head of the court. The National Assembly, the Supreme Court chief justice, and the President are each charged with appointing three justices to the nine-member Constitutional Court. The LKP took issue with Kim Ki-young's past participation in an international human rights law institute as well as multiple cases of false residence registration — an illegal but common practice used by the well-off to send their children to better schools in different districts, or to maximize real estate gains. 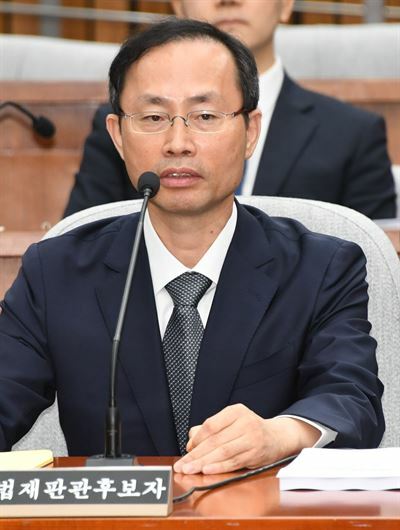 Lee Jong-seok, the LKP's nominee, was also found to have committed the same offense during his confirmation hearing. As opposition lawmakers are now adamant on blocking Kim's appointment — even at the expense of their own nominees — it seems likely the Constitutional Court will continue with six members for some time. President Moon has directly called on the Assembly to speed up the appointment process for the three justice positions.